81. Had your buttons pushed lately? For those who don’t know the expression, if you have your button pushed, you havea strong emotional reaction to what someone says or does. The reaction can be withdrawal or explosion or somewhere in-between but there is a strong emotional response. Of course, Rite doesn’t push my buttons any more (!) but if she did she would do things like: keep me waiting while she does those last minute things that can make us late or stops and talk to someone and ends up hearing their life story which then requires a whole change of plans or makes a commitment to do something that ends up requiring help (my help)….. I have been on many leadership teams and when for instance, there is a negative response to one of my ‘great new ideas’and they raise over-the-top detailed implications, one of my buttons gets pushed! Often one of my buttons is pushed because a value is not being upheld, like students not being treated with honour, generous hospitality not offered, a lack of process in major decisions, and the list goes on. I am sure you have your own examples of button pushing. Siblings, friends, husbands, wives, leaders and team mates know how to push one another’s buttons. Depending on our response to our buttons being pushed, determines whether the situation moves to offence and on to conflict. Many conflicts start out as very small issues that grow with time and feeding. 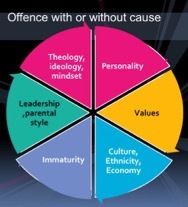 Often, we aren’t aware of differences of personality, values, culture, immaturity, leadership style or theology. It is going to require us to do some homework, and even when we do have some understanding, we need to stand back from the situation to be objective. It’s not easy to put ourselves in the other person’s shoes and see things the way they do. However, this is essential if we hope to come to resolution of our disagreements. Think about how your buttons have been pushed recently or how you have pushed other’s buttons. Perhaps there are three basic stages – feeling hurt or hurting others; being offended at someone or offending others; being in conflict with others through disagreement, attack or withdrawal. It is possible to begin on any level. In an instant, a disagreement becomes a two-sided fight with hurt feelings and offence. While writing this, I am watching four seagulls that are initially sunning themselves on the sand. Then suddenly two start squawking at the other two and a battle is begun, until one party is intimidated and retreats. But no reconciliation or resolution has taken place. How often does that happen in life? We can choose to allow that hurt or disappointment to grow into an offence to someone’s Attitudes, Behaviour or Communication with or without cause – the ABC of offence. Their ABC may not be wrong but they can still offend us due to our interpretation, values or way of thinking. This requires us to do something in terms of speaking, letting go and giving to God. We can allow our offence to stay active, where we hold on to certain beliefs, opinions or values that are in conflict with another person(s) and no one is willing to move from their position. This may require mediation in order to come to reconciliation of the relationship and then resolution of the conflict. An example: Years ago, my wife and I were leading an outreach and we communicated to a couple on the team that we would involve them in the leadership, so they could transition into leading the team as we were only going to be there for half the outreach. With the pressure of time, we neglected involving this couple in decision making and they felt hurt in the process. They let it go initially but as the situation continued, hurt can easily move to offence and they felt they needed to speak to us. So, they approached us for a meeting. When they shared, we listened and were immediately aware of our neglect of our promise to them. As we apologised and asked for forgiveness, there was an immediate release of any offence and the relationship was reconciled. Over the next week, we sought to resolve the issue by preparing them for their leadership role. It takes emotional energy to share hurts and offence and it is important that leaders are ready to listen, are humble in their response and careful and wise in the process of reconciliation and resolution. The situation above could have turned out very differently if we had felt defensive or threatened and not owned up to our failure. At every stage, we need to be discerning the Lord’s will in terms of letting go of a situation or following it through, having our attitudes right and staying away from any sense of revenge or wanting the other party to suffer in any way. God is able to deal with individuals and bring consequences – that’s not our job. Keep the unity of the spirit: We are commanded to make every effort to keep the unity of the spirit in the bond of peace (Ephesians 4) by being completely humble and gentle; be patient, bearing with one another in love. That requires facing up to conflicts and working them through. Every conflict involves all the parties involved: It is often felt that the blame is solely on ‘the other’ person, but this is rarely the case. Ask yourself, if I went back in time, could I do anything differently that would have brought about a different outcome? As the leader, be first in expressing humility: The leader, due to his/her power/authority role needs to lead the way in expressingtheir humility, even if the percentage of responsibility in the conflict is less. Beware of creating stories and interpretations: Where communication has been poor, and infrequent, the potential for “storiesor interpretations” to be created increases – opinions, questions, concerns, judgements…. Poor processes are often at the heart of a conflict: Many conflicts take place because of a lack of process, a lack of agreement in the process, or an inappropriate process. So, in conclusion, when we face conflicts, let’s not respond with, ‘I’d agree with you but then we would both be wrong!’ Let’s not listen with the intent to reply but rather listen with the intent to understand. This entry was posted in Servant Leadership and tagged conflict, hurt, listen, offence, poor process. Bookmark the permalink. ← 80. Enjoying close relationships?